The STB-1 is a Japanese tier 10 medium tank. A primeros de los 60, Mitsubishi comenzó el desarrollo de un nuevo carro que cumpliera con los requerimientos del gobierno en armamento y defensa. Los dos primeros prototipos del STB-1 fueron fabricados en 1969 para ser sometidos a pruebas. En 1970 los prototipos fueron presentados ante la prensa y participaron en un desfile militar. The STB-1 marks the end of its Japanese medium line. Poor overall hull armor, relies more on slope than thickness. The STB-1 is similar to the previous tanks in the line, with the exception that it now has much better turret armor than the tanks before it. It can reliably hull down unlike its predecessors due to a much needed increase in turret armor. While no longer having the highest DPM on a tier 10 medium, it still has the fast reload and the 390 alpha damage of the L7, the STB-1 is a very serious threat when hull down as it can very quickly outgun almost anything that isn't an autoloader. The tank itself is very small and as a result has a good camouflage factor and is also relatively mobile. While its camouflage and mobility are not on the levels of a soviet medium such as the T-62A, they are still above average for their class. However to set it apart from soviet mediums, it has 10m more view range. However, while it is a menace at medium to close range when hull down, the STB-1 performs poorly at long range. With poor dispersion values, a semi-high base aim time, and subpar base accuracy, the STB-1 has significantly longer exposure time than other tanks in its class, with the exceptions being the 121 and the Batchat 25t. In addition, the tank does not perform very well when not hull down. Its hull might be well angled, but the armor is very poor, meaning even light tanks can penetrate it frontally without too much trouble. To make things worse, the ammo rack sits in the front and is prone to damage and the driver often gets killed. Last to note, while the turret overall is strong, the closer to the center of the gun mantlet shots land, the weaker the armor gets. Occasionally, high penetration HEAT rounds may also pen the turret even in stronger areas. Ultimately, the turret should be used to minimize exposure, not to deflect shells completely. The JGSDF started studies on a new tank design with Mitsubishi in 1962, as it was realized that the Type 61 would not be able to defeat the latest Soviet designs like the T-62. 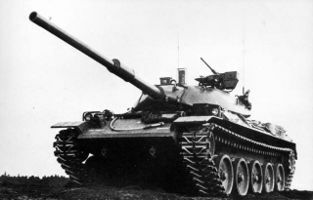 Features from several designs were incorporated, including the controllable suspension of the US-German MBT-70 project, the hull of the Leopard 1, and the L7 105mm gun. The design included a rotating cupola for the commander, and a new autoloader for the main gun. The design was finalized in 1964 and various test rigs were built between 1964 and 1967. The first prototype, designated STB-1, was delivered in late 1968 and underwent a number of modifications until 1969. The autoloader proved too complex and expensive, and was removed, additionally the remote controlled anti-aircraft machine gun was removed. The design of the turret was also changed, becoming longer. These changes resulted in the STB-3, which was delivered in 1971. The final prototype designated STB-6 was delivered in 1973. Production finally started as the Type 74 in September 1975, with 225 being delivered by January 1980. Production ended in 1989, with total production running to 893 examples. In service, the tanks were updated with the addition of infra-red imagers (not image intensifiers) for the commander and gunner, and a laser rangefinder in the commander's cupola. The gunner's position included a digital fire control computer, fed range data from the commander's range finder. Rounds for the main gun were upgraded from HEP to APFSDS and HEAT-MP. The Type 74 tank has the Mitsubishi 10ZF Model 21 10-cylinder two-stroke cycle diesel engine providing 750 hp (560 kW). At 19 hp/tonne, its power-to-weight ratio is similar to the French AMX-30. The maximum quoted road speed of the Type 74 is 53 km/h but its top speed is at least 60 km/h. 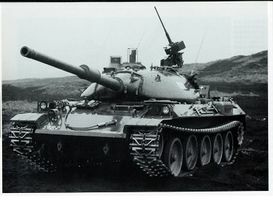 The Type 74 was generally outdated even before it entered service. The Type 90 was to have replaced it outright, but with the ending of the Cold War these plans were scaled back. In 1993 four Type 74's were improved to the new Type 74 Kai (改) [Type 74 mod G (G型)] standard, adding a passive infrared camera, side skirts, and so on. The upgrade proved to be extremely expensive, and the program was dropped. The STB-1 actually has 12 degrees of gun depression with its hydraulic suspension, but in game it only has 10.